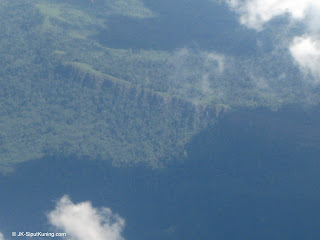 The pristine rainforests of Central Borneo. For centuries, Borneo has captured the fascination of explorers and naturalists from all over the world. Alfred Russel Wallace, one of the prominent Naturalist of his time, described "my pleasure was increased as I daily got numbers of species, and many genera which I had not met with before" during his stay in Sarawak in 1855. 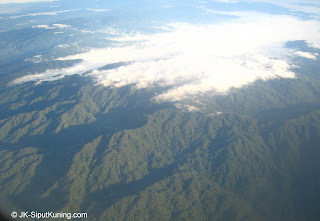 The increasingly well-known, species rich Maliau Basin in Central Sabah, Northern Borneo. Centuries on, as a continuing testimonial to the biodiversity of Borneo, an astounding 123 new species has been found in the deep forests of Borneo stretching 220,000km square across three countries namely Brunei, Indonesia (Kalimantan) and Malaysia (Sabah and Sarawak states) in the short time span of 3 years. 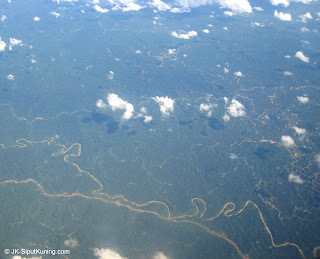 One of the many rivers that made up Borneo's important wetlands, leading people to term Borneo as "The Amazon of Southeast Asia"
Tall dipterocarp forests spread over much of the remaining lowland primary forests of Borneo. Shown here is the Sepilok Orang Utan Sanctuary's forest canopy. Among the discoveries is the mollusc-Ibycus rachelae, a long tailed slug found in the mist covered, montane forests of Mount Kinabalu and described by Menno Schilthuizen and Liew Thor-Seng. It has a peculiar calcium-carbonate-made-love dart which penetrates its mate partner during courtship and injects hormones to "seduce" its mate and increase reproduction chances. Easy to romanticise and entitle this slug to be named "the real cupid"! Logging roads criss-crossing the terrain in Northern Borneo. This activity, along with expanding oil palm plantations, are among the many threats this biodiversity hotspot faces. Borneo is indeed crawling with new wildlife and plants waiting to be discovered. Who knows, every daily stroll in the Borneo forest will produce several new to science creatures and plants? This is really a place worth exploring! A sparkling, intricately shaped spider's web under the tropical sun rays filtered by the canopy foliage. One of the many natural wonders found in Borneo. There is definitely something to explore and discover in the depths of this surprising Bornean Rainforest! 2. WWF-Malaysia's Heart of Borneo-Three Countries, One Conservation Vision webpage. A very nice read indeed!